...or "you have to change your life". number plate for the farmer's 4-wheel Mitsubishi, here on the forest street to "Voestn Alp"
My life started fresh and filled with hopes and expectations. 1971: After three months severe sickness existence crashed this dream. The call “you have to change your life” was unmistakable. 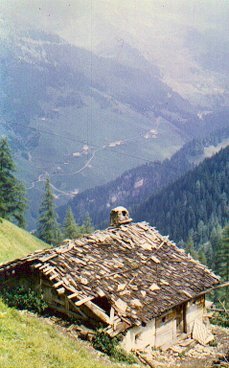 With 24 years my great session from ‘normal’ society happened: Instead of finishing my studies my new job in the summer 1972 was totally different: work as shepherd in the mountain in 1882 meters above sea. My home was an ancient wooden house with open fire, no electricity and no water tub. Fresh water had to be brought from the fountain. My first young wife shared these mysterious months with calves, goats, sheep, with rain and from time to time snow too. Snow in the summer is not funny there! My studies have failed, my health was damaged after three months in hospital 1971, my memory was nearly burned out by cruel chemical and mechanical psychiatrist treatment. Every little step had to be learned again. 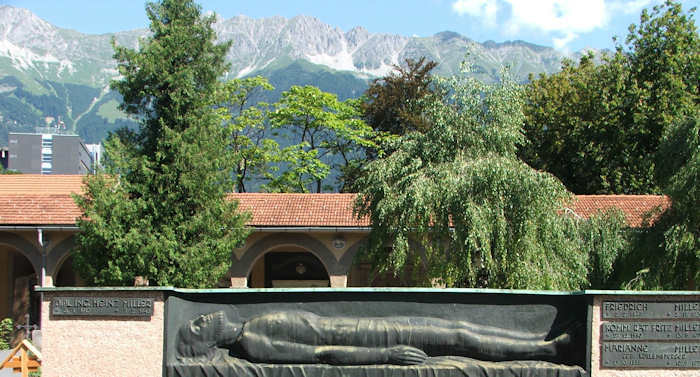 The Austrian valley Navis was very familiar since my early childhood. In my first school year my parents visited Navis in winter time for my first time. A priest with two women was operating the guesthouse Widum beside the church. Nearly every year we travelled again to this mysterious place, where my father thought me to read and to write and to ski. The joy to read and write became part of my life, my entertainment, my consolation, my friendship. 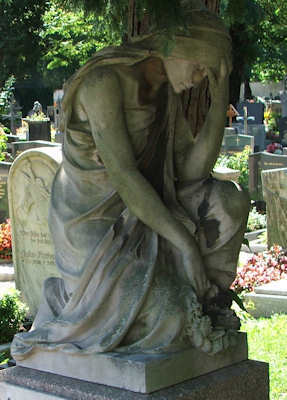 The sentence "you have to change your life" wrote the poet Rilke. Peter Sloterdijk, born 1947, one year before my birth, wrote this year a 717 pages book with the title: "You have to change your life." 1972 my heath and studies were spoiled. 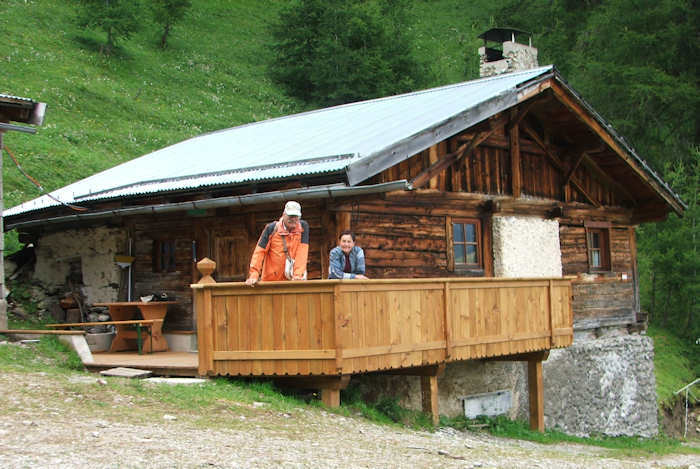 But life in the Alpes Hut with wife, animals, nature was healing. Again a big book was my friend: "The Tibetean book of death." At least not working for a money-&-power career some fantasy is needed, to have something important to do. Reading books gives this feeling of importance. One of the most impressive books in my school days was Gurdjiff's "Beelzebub" and from his disciple P.D. 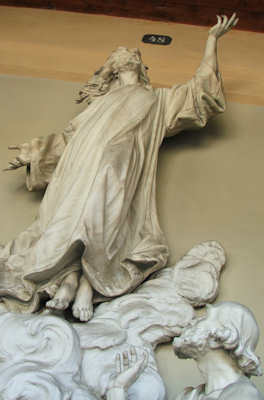 Ouspensky "In Search of the Miraculous". From so called "Holy Scriptures" of Asian, European and Indian culture my search wanted to explore more mysteries. Besides “Rajneesh Bibles” books like Quran, Upanishads, Talmud and an unforgettable experience on an healthy LSD trip gave me Buddha’s book as “Divine Device”: You have to change your life! Back from fantasies to reality: These mountains are merciless. In the height of the Alp Hut we had carefully to collect wood for the fire. Most mornings were very cold, sometimes nearly freezing in the middle of the summer. 717 pages: "You have to change your life"
Today Mima's car has this comfortable gas oven, to warm my feet, my belly, my bones. The sun kisses the mountain peeks at 6.00 a.m., but inside the car it is still only 7.00 degrees Celsius on a parking place at 1400 meters above sea. As young man of 24 years with my wife we had to change our life in the most practical way. We had to collect wood for fire, bring water for coffee and dry socks for the boots. We had to look for the calves, to milk the goats and had to be healthy in this hard nature. 1972 only my brain was rather damaged by this cruel psychiatric treatment one year ago. All my trust was lost: Trust in authorities like Doctors, trust in state officials in our German country, responsible for WW2 and the atrocities in an industry to kill people! My love for life had to recover in the mysteries of mountains and nature. My wife was only 23 years old. She had a wonderful body, nice face and long hairs colored in black. 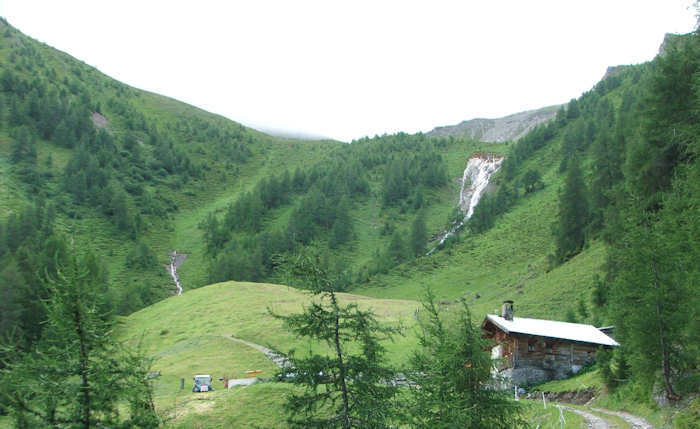 She provided all female treasures for a man in need of tantric lessons in our Alps hut. But only two hundreds meter higher in my hermit’s mountain paradise with calves and rare wild animals too my mind was digging in these treasures, maybe hidden in the "Tibetean Book of Death"? Compared with studies and money career of my brothers and friends already a great change has happened to my life! My younger brother finished his studies and started to earn money as teacher. My older brother made his first million. But we drove after three months in the mountains on our old Heinkel scooter to Maroc - for holydays. My way of drunkenness and unhappiness was nearly pathological. Books did't help much to bridge my separation from the ordinary discipline with job and making money. My efforts tried to learn piano in such perfect way, that with my own songs my thoughts could be published with higher harmony. It took nearly seven years, to show up with my cabaret program. The woman, who was singing these songs, had stopped her studies at a theatre school. She used the life with me, to get pregnant with my daughter, born 1978 and dying 30 years later. Nothing could help my adored child, neither her husband, not or home, not her juristic examination. "You have to change your life", was the claim for my first India voyage 1976. This was an arduous overland trip by train, bus, bullock card, ship, and back by plane from Bangkok. "You have to change your life", was my effort in a Meditation school of Maharishi Mahesh Yogi in Madras, now Chennai. This "Transcendental Meditation" with the most secret and holy Mantra "OOOOINK" didn't change much my life. Except maybe this new woman was singing my songs and gave birth to my daughter. for his disciples: "you have to change your life"! My brothers and sisters in Buddha Bhagwan’s belief couldn't stand me as so called "Swami". They set me free from the burden, to propagate as street clown Mr. Rajneesh with his picture around the neck. Rajneesh called this advertising "Mala". We disciples had show up with his Mala and red clothes in grey cities. Bhagwan was a Master in his requirements for his disciples: "you have to change your life"! The next little, lovely woman, my youngest and best educated one helped me, to change my life. With finally finished business examination at my age of 40 a more middle-class career could start. Again "you have to change your life" - and where could this done better than in the next Indian pilgrimage to Poona, to Bhagwan? But this new little lady of mine preferred in our holydays instead of several weeks Ashram worship a journey to Goa and other parts of India to Trivandrum. My six years old daughter lived with her mother in this year in the Poona Ashram. My daughter too was tired of the Ashram and so she drove with us in the bus from Poona to Goa. From there my daughter returned with another woman to the Poona Ashram back to her mother. "You have to change your life" again, because on Bhagwan's death day, 19th January 1990 my most beloved little lady left. So a new woman had to take care for our aim, "you have to change your life". Five years later we had changed enough of our life together. The next change of life came with my Mimamai, the women with my deepest and longest heart understanding plus guicance. Since last rainy week end this Peter Sloterdijk book "you have to change your life" is my best friend - beside my woman. Guess that soon an English translation will be available, because this book is the most precious one after all my friendly books - better friends than most other. 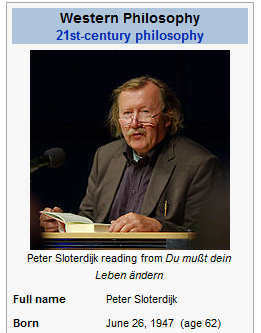 Peter Sloterdijk connects nearly three thousand years of history in physic and psychic. The philosopher opens my understanding for all my life fights and quarrels for a change to more peace and freedom. Sloterdijk - thanks! "you have to change your life". 'Existence' had changed my life meanwhile in such a way, that these merciless mountains are more and more out of reach. My old body can't stand without better training the sun anymore. Sun plus muscle efforts start to torture my head, make my stomach turn around. As shepherd 1972 my woman drove with me on this old Heinkel Scooter, built in Mima's birth year 1959, to Innsbruck on a sunny day. We came back to our Alp Hut in the late afternoon. The goats were standing next to highest peak in around 2400 meters to enjoy the last sun - together more than 1000 meters difference! In those years my legs and lungs were still strong enough, to run after these “beast”, to bring them home in the stable, and get their milk and feed them with salt. These kind of “mountain jumbs” are not more possible, but still it sounds in- and outside: "You have to change your life." Read Peter Sloterdijk please, to understand more the reason, why this change will be inevitable - for you too - and hopefully your change of life will be less painful.